Please come in and visit My Studio. 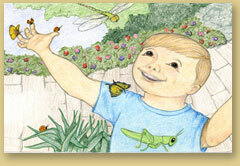 My children's book portfolio is now online, and features children's book illustrations plus drawings and sketches in both black and white and color. There has been an exciting change in my Frenchie Card Gallery - we have moved! You can now find French Bulldog notecards and more in my Etsy shop. Come visit me on Etsy! (JBalsamFrenchieArt). Want to know what's happening? Please sign up - to receive an occasional update. Thanks!